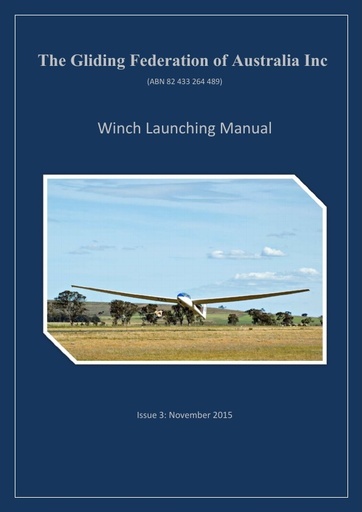 This Aerotowing Manual is the reference document for the assessment of competency of glider tow pilots and the issuing of Glider Towing Endorsements by GFA to the holders of a CASA issued Part 61 flight crew licence, or for the issue of an RA-AUS glider towing endorsement, or for the issue of a GFA Self-launching Sailplane Pilot Endorsement. Although the title of this book is largely self-explanatory, a few words of further explanation may help to understand its specific purpose. 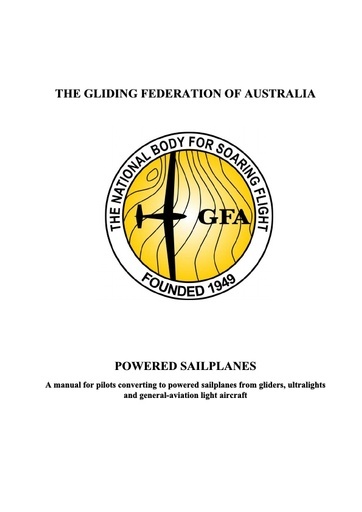 The Gliding Federation of Australia (GFA) is responsible to the Civil Aviation Safety Authority (CASA) for the conduct of safe gliding operations in Australia. This includes the setting and maintenance of flying standards and in particular training standards. Most glider-pilot training is practical and “hands-on” in nature. However, there is an amount of theoretical knowledge which is not only desirable, but actually makes the task of learning to fly easier and more pleasurable. The theoretical knowledge is imparted progressively as flying training continues. The purpose of this book is to provide a reference for the kind of knowledge which you will need as you progress through the various certificates. It covers everything you will need during training, from the basic reasons why a glider is able to fly in the first place to the meteorology which enables it to soar. It also covers most essential items in between, such as air legislation, basic navigation and use of radio. 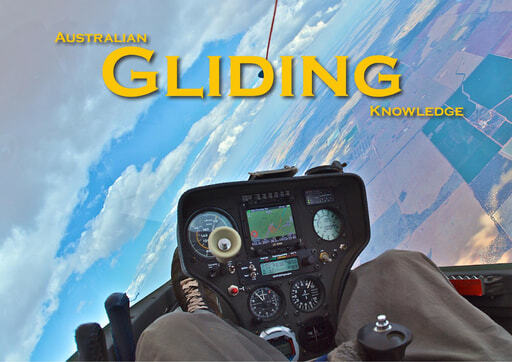 This document has been prepared by The Gliding Federation of Australia Inc (GFA) as an aid to all pilots, but particularly those involved in cross country or competition flight. It is anticipated that in future additional items will be included in the Pack. This document is filed with the GFA Manual of Standard Procedures (MOSP) Part 2 (Operations). Click on the download link to be redirected to the relevant download page. This document is designed to track a student's training progress and to ensure continuity of training. It is intended that once the student has been briefed and/or had some element of the syllabus demonstrated to them, the instructor will complete the ‘Briefed’ column for that part of the syllabus in the training record. As the student demonstrates the required competence in a topic, their instructor will sign off the training record for the competency met. While the record has been designed to flow in line with the GPC syllabus, it is not necessary that the student demonstrates proficiency in an element before proceeding to the next. The instructor will progress their training based on the student’s ability, aircraft availability and the weather conditions on the day, and may make notes to assist the trainee in the ‘Additional Notes’ at the end of the document. The Glider Pilot Training Record is also available for online purchase from the GFA store. It is A5 size, in full colour, and spiral bound to make it easy to use on the airfield. Most aircraft accidents are linked to deficiencies in human performance. These deficiencies may involve a variety of factors. The factors include poor lookout, situation awareness (SA), decision-making, task organisation, communication, failure to recognise threats to safety and the commission of errors. Human Factors are often perceived as 'psychobabble' and the realm of the psychologists, rather than an extension of old-fashioned 'good airmanship'. Also, Human Factors have been associated more with multi-crew and airline operations, rather than sports aviation single-pilot activities. The intent of this document is to provide guidance on the incorporation of single-pilot Human Factors into glider flight operations. The GFA acknowledges Graham Wardell of the Auckland Gliding Club N.Z for allowing the use his Human Factors material in the development of this manual. This document explains the legal posiiton surrounding the recovery of a glider following an outlanding. While there appears to be no absolute authority by which the pilot (or the police) can demand to enter the farmer’s land to retrieve a glider, this does not mean that the farmer can assume control or possession of the glider. This advice explores "recaption" as a defence to trespass when entering the land to retrieve the glider. This handbook covers the characteristics of all varieties of powered sailplanes and power-assisted sailplanes, together with the conversion requirements and training syllabi for pilots coming to them from gliders or powered aircraft. 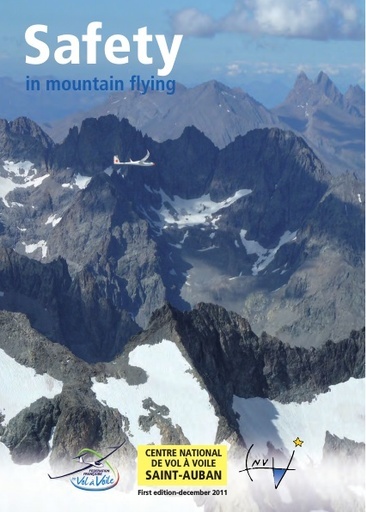 This booklet, published by the French Federation of Soaring, outlines the risks and threats of mountain flying. It stresses the technical aspects as well as the human factors. Winch launching is an effective and safe method of launching a glider, but it is less tolerant of gross pilot error than almost any other phase of a glider’s flight. In other words it is only safe if all the well-established principles and methods are closely followed. This manual covers all aspects of winch launching, including basic techniques, pilot training and checking, winch driver training and checking, wire and other equipment standards, driver protection and all potential failure cases. Auto (motor-car) launching is similar in principle to winch-launching and most of the procedures designed for winch-launching are directly applicable to auto-launching. Any divergence from winch practice will be found in a table of differences at the end of the manual.